Park the vehicle on a level surface and apply the parking brake. Start the engine and let it idle until it reaches operating temperature. Turn off the engine. Wait more than 10 minutes for the oil to drain back into the oil pan. Remove the dipstick again and check the oil level. It should be between the H (High) and L (Low) marks B . This is the normal operating oil level range. 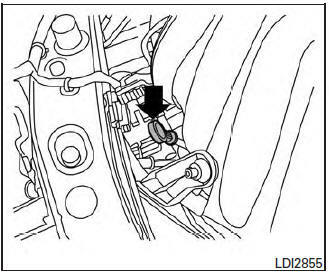 If the oil level is below the L (Low) mark A , remove the oil filler cap and pour recommended oil through the opening. 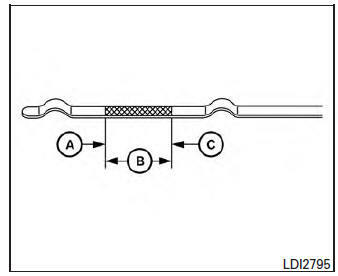 Do not overfill C .
Recheck oil level with the dipstick. CAUTION Oil level should be checked regularly. Operating the engine with an insufficient amount of oil can damage the engine, and such damage is not covered by warranty.